Key Take-away: Political violence may erupt in Iraq as supporters of Muqtada al-Sadr continue large-scale protests to pressure the current government to reshuffle the cabinet fundamentally. Sadr had threatened on February 26 to withdraw his support from Prime Minister Haidar al-Abadi if such an overhaul did not occur by March 29, 2016. The Sadrists began a large sit-in at the entrance to the Green Zone on March 18 and are harnessing the power of street demonstrations to either compel PM Abadi to comply or make it possible for him to do so. Former Prime Minister Nouri al-Maliki and his supporters within the State of Law Alliance (SLA), rather than Abadi, seem to be the chief obstacle to a cabinet reshuffle. Other political blocs seek to neutralize this faction while retaining their current representation in cabinet. Meanwhile, some political blocs, including the Islamic Supreme Council of Iraq (ISCI) and the Sadrist Trend, are in the process of attempting to create a new political alliance that could challenge Maliki’s State of Law Alliance (SLA) as the dominant political bloc. It would need to overcome a plethora of obstacles to succeed, but could be the basis for a cabinet reshuffle process aimed at weakening the SLA and its dominant leader, Nouri al-Maliki. ISCI and the Sadrists may throw a lifeline to Abadi, or he may be political collateral damage in their play to counter Maliki. It is unclear what Sadr will do if there is no cabinet reshuffle by March 29 that meets his standards. He may compromise, as he might sacrifice some of his reform demands in order to strengthen himself or weaken Maliki and his Dawa Party. Alternatively, the Sadrists may continue the sit-in and pull out of the government, as Sadr threatened to do on February 13. The prospect for violence – initiated either by the demonstrators or by the security forces to break up the sit-in – remains a possibility that could destabilize or even collapse the already precarious Abadi government, and it is far from certain that PM Abadi will be able to retain his position if a new government is eventually formed. Above: Tens of thousands of supporters of Muqtada al-Sadr demonstrated in front of the gates to the Green Zone in Baghdad on March 18 before beginning the sit-in. Prime Minister Haidar al-Abadi announced a cabinet reshuffle on February 9, intending to form a government of technocrats. 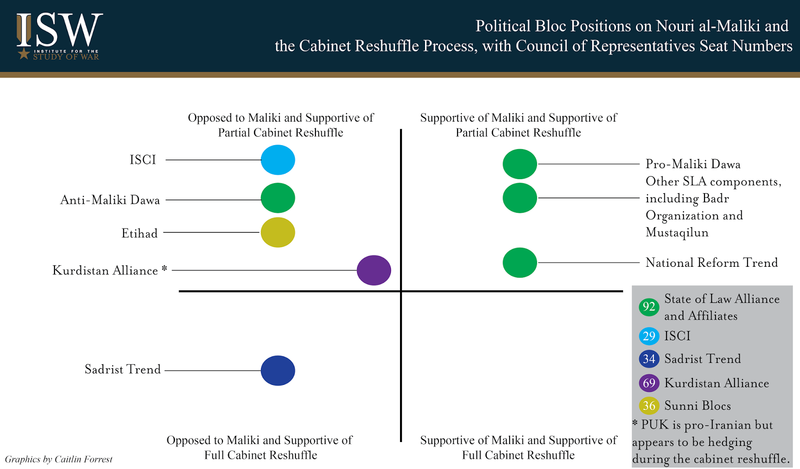 Most other political blocs predictably attempted to use the cabinet reshuffle to forward their own political goals and preserve their positions within the cabinet, and ISW previously assessed that a protracted cabinet reshuffle process could lead to street violence or even PM Abadi’s resignation if political blocs could find a consensus candidate. However, Sadrist Trend leader Muqtada al-Sadr, having moved to position himself as the leader of popular demonstrations against corruption and poor government performance, has organized and attempted to harness street demonstrations to force PM Abadi and the political blocs to enact broader reforms. Sadr gave the government a 45-day deadline on February 13 to conduct comprehensive reforms. He later escalated his pressure on PM Abadi by speaking at a large demonstration in Tahrir Square on February 26 before announcing a sit-in on March 12, calling on his supporters to assemble at the entrance to the Green Zone on March 18. PM Abadi and the leaders of political blocs expressed concern over the sit-in, which the Council of Ministers (CoM) and the Interior Ministry rejected on March 16 and 18, respectively, due to security concerns and their legality. Sadr responded with his own rejection of the possibility of shutting down the sit-in. Security forces deployed across Baghdad prior to the start date to prevent demonstrators from accessing the sit-in site, blocking off key roads with concrete barriers and closing off the Republican and Sinak Bridges. The heavy security presence may have led to violence between security forces and thousands of Sadrist supporters converging on the Green Zone; at least one confrontation was recorded in Baghdad, when riot police used water cannons against Sadrist supporters near the Republican Bridge, ostensibly to protect Baghdad Governor Ali al-Tamimi, who was nearby. However, the Baghdad Operations Commander, Abdul-Amir al-Shammari, ordered security forces to re-open entrances into the city and lift the barriers on the Republican and Sinak Bridges. Shammari’s actions reduced the possibility of confrontation but infuriated PM Abadi, who shortly thereafter, marched to the Joint Operations Command (JOC) and announced that the JOC, not Baghdad Operations Command, would thereafter have responsibility for Baghdad’s security file. Above: Sadrist supporters approach a line of security forces on the Republican Bridge, northeast of the Green Zone, on March 18. Security forces withdrew from the barriers later in the video, allowing the demonstrators to pour through and over the bridge towards the Green Zone. The Sadrist Trend’s management of the sit-in process has been highly disciplined and organized. Notably, Sadr charged Ibrahim al-Jabiri, the leader of the Baghdad branch of Sadr’s charitable foundation, the Office of the Martyr al-Sadr, with overseeing the sit-in and forming a management committee. 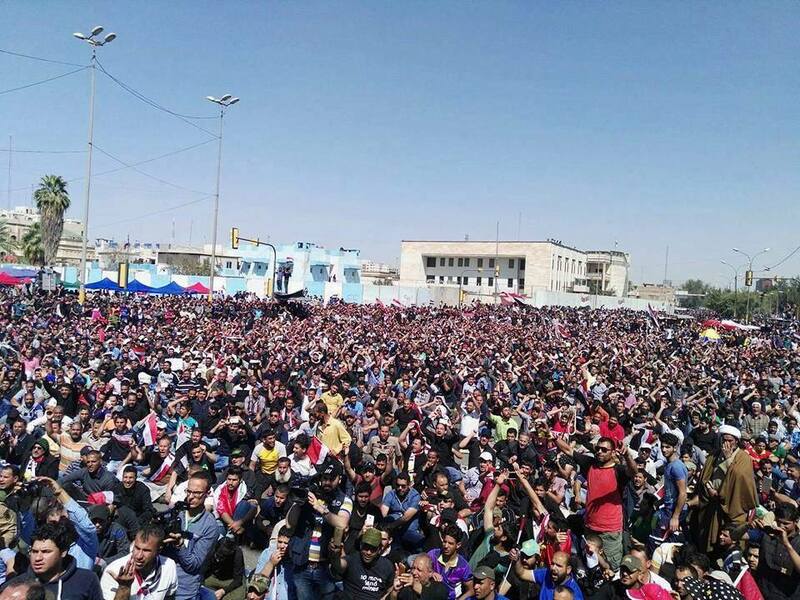 The day after the announcement, the committee began erecting tents and opening up to 93 centers across Iraq to register volunteers who wished to participate in the sit-in. Sadr stressed the importance of non-violence and discipline among the demonstrators, ordering sit-in participants to bring no weapons, initiate no violence, cooperate with the security forces, and obey the sit-in coordinators. He also insisted on maintaining a disciplined and national public image, calling on demonstrators to avoid blocking roads, keep the sit-in site clean, and not to create excessive noise that disturbs local residents. The sit-in’s organizing committee maintains close control over the sit-in participants’ activity, assigning them tents, requiring them to wear an identification badge, and encouraging them to don uniforms bearing the Iraqi flag. The Office of the Martyr al-Sadr has not only supplied tents and food to the demonstrators, but organized events as well, with Jabri leading regular prayer sessions, overseeing a pop-up art and book market, and attending poetry readings while conducting meetings with security forces officials to facilitate stability and coordination. Jabri’s attendance of a wide variety of events and the high level of central organization indicates little chance of the sit-in dispersing due to logistical shortcomings. 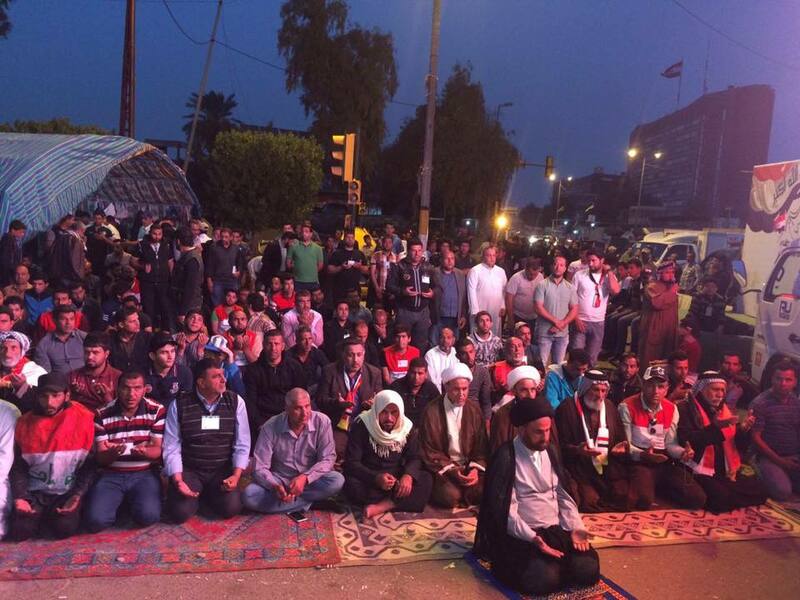 Above: Head of the Baghdad branch of the Office of the Martyr al-Sadr, Ibrahim al-Jabri (bottom center in front of crowd) leads an evening prayer session in the Green Zone sit-in site. Several demonstrators are wearing Iraqi flag shirts, as encouraged by the Sadrist organizing committee. Others can be seen wearing identification cards on lanyards. The sit-in has continued since March 18, and Sadr has shown no willingness to back down. Instead, Sadr has taken the initiative and is attempting to force PM Abadi and other political blocs to concede to his reform agenda. The approaching end of Sadr’s 45-day deadline and the sit-in has set political blocs scrambling to come to an agreement over the cabinet reshuffle, but it appears that the only thing blocs can agree on remains their refusal to lose positions within the cabinet. PM Abadi publicly aired his frustration with the political blocs, blaming unspecified ministers for blocking the cabinet reshuffle process in order to keep their positions and privileges. Former PM and current Vice President Nouri al-Maliki is steering the cabinet reshuffle process in a manner that is preventing the political blocs from agreeing on the cabinet’s final composition. Maliki is technically a member of Abadi’s own political party, Dawa, a component of the SLA. He and his backers form an important source of parliamentary support for Abadi and his premiership. Maliki, however, is actually Abadi’s primary political rival, because he seeks to regain the premiership and could withdraw his support from Abadi in a manner that collapses his government. Abadi had tried unsuccessfully to force Maliki’s resignation in August 2015 by abolishing the position of the vice presidency, but the effort failed, and Maliki thus retained his position within government. Sadr stated on March 21 that PM Abadi, Masoum, Juburi, and political bloc leaders displayed “ignorance” over the well-being of citizens and repeated calls for comprehensive government change. More worryingly, a senior al-Ahrar Bloc member, the main political party of the Sadrist Trend, dismissed the results of the meeting and warned that demonstrators could “storm the Green Zone” if reforms did not materialize by the March 29 deadline. Sadr had vaguely alluded to this possibility on February 26, when he stated that “we are on the walls of the Green Zone, and tomorrow, the people will be in it,” though a senior Sadrist official later insisted that demonstrations would remain peaceful. In addition, on March 22, Sadr announced that a committee he had formed on February 20 to nominate technocrats for the new cabinet had completed its work, producing a 90-name list for government nominations to be passed to PM Abadi. An al-Ahrar Bloc member insisted the list be reviewed and voted on in the CoR, lest al-Ahrar withdraw confidence from PM Abadi. By referencing the deadline, providing nominations, threatening a withdrawal of confidence, and continuing the sit-in, Sadr is escalating pressure on PM Abadi and other political blocs to support a comprehensive overhaul of government. On March 24, three notable events occurred that indicated that ISCI was challenging PM Abadi and the SLA. First, one of the most senior members of ISCI, Oil Minister Adel Abdul-Mahdi, resigned from his post and stated that he would no longer attend cabinet meetings. Although many ministers have offered their resignations in the past to indicate their support for reforms, Abdul-Mahdi appears to have actually resigned with the intention of vacating his position. It is unclear if he did so on Hakim’s order and if he is still receiving his salary. Second, ISCI leader Ammar al-Hakim met with Muqtada al-Sadr in Najaf to discuss the ongoing reforms as Abadi met with the pan-Shia National Alliance in Baghdad. The National Alliance is an umbrella group for all major Shi'a political parties, including the SLA, ISCI, the Sadrist Trend, Fadhila Bloc, and the National Reform Trend. The National Alliance’s role is to unite and coordinate Shi'a political activity in Iraq, but it has largely been unable to overcome existing differences between political blocs. Third, Hakim also met with Badr Organization leader Hadi al-Amiri to discuss reforms. The Badr Organization is an Iranian-supported proxy militia that fractured from ISCI in 2012. Maliki has lately cultivated its support, as he has with other Iranian proxy militias, since he otherwise lacks a powerful military organization. The meetings indicate that Hakim has been attempting to form agreements with senior political and military leaders regarding next steps in the cabinet reshuffle process. Finally, on March 24, Fail al-Shammari, a member of the Mowatin Bloc, which is a component of ISCI, stated that ISCI was in the process of forming a “cross-sectarian” bloc with a unified vision regarding the reforms. 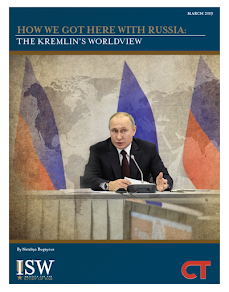 The statement reveals that efforts persist to form a new political alliance composed of members of multiple blocs. PM Abadi had called for such a bloc on February 27 to support national reform efforts. Sadr and Hakim met on March 2 and jointly expressed support for the creation of the bloc, which also received support from individual members of various Sunni, Kurdish, and Shi’a parties, including Dawa Party, Mustaqilun, Etihad, the Sadrist Trend, and ISCI’s Mowatin Bloc. The bloc aimed to produce a majority in the CoR in order to allow PM Abadi to pass reforms and legislation. Members of other parties, including the secular Wataniya Alliance and the Patriotic Union of Kurdistan, are also reportedly interested in supporting Hakim’s effort to build the alliance. However, an SLA member, Rasul Abu Hasna, dismissed talk of the new bloc as “rosy dreams,” suggesting that the bloc faces opposition from within the SLA. It is important to note that Shammari’s account was not fully accurate – he also announced that all three ISCI members had withdrawn from government, which an ISCI spokesperson swiftly denied. However, the statement did indicate that backroom discussions over the cross-sectarian bloc were still in progress. Hakim’s pursuit of the cross-sectarian bloc – and the dismissal of it by an SLA member – makes sense in that he has been attempting to position himself as a powerful political figure for some time but has been consistently blocked by the SLA. Hakim had tried to secure the leadership of the National Alliance in January and February of 2015 with the support of Sadr, but never managed to obtain it, as the SLA – nearly three times the size of ISCI within the CoR – insisted that senior SLA member Ali al-Adeeb chair the National Alliance and blocked Hakim’s efforts. Unable to come to an agreement, the National Alliance political blocs reached a stalemate, and previous chairman and current Foreign Minister Ibrahim al-Jaafari simply stayed on in his position. Hakim’s effort to build a new bloc could thus be a way for Hakim, who does not hold political office within the government, to increase his political power at the expense of Maliki and the SLA. By cutting out the senior SLA leadership – namely, pro-Maliki Dawa Party members – from the new alliance, ISCI would neuter the ability of the SLA to influence decision-making and increase ISCI’s influence, but would consequentially fracture the pan-Shi’a National Alliance. A new cross-sectarian alliance would also benefit other political blocs as it would level the playing field between them and the SLA. Members of minority groups, such as Sunni blocs and the Kurdistan Alliance, would benefit from any weakening of Maliki, who is a sectarian actor. The Sadrist Trend would benefit in that it could weaken Maliki, Sadr’s primary opponent, and strengthen the Sadrist Trend as a political force at the expense of the SLA. Pro-Maliki members of the SLA, such as components of the Dawa Party and the Badr Organization, however, are motivated to keep the National Alliance intact, as they are the dominant force within the National Alliance. The SLA is likely preoccupied with preserving its power within the cabinet – Adeeb’s statement on March 12 complaining about the SLA’s intransigence is a major indicator of this trend. If successful, the new cross-sectarian bloc would thus serve to unite a number of political blocs that are opposed to Maliki creating what is essentially an anti-Dawa Party alternative to the National Alliance. However, opposition to Maliki may not be sufficient to create a functioning alternative, as the new bloc would still have to overcome a bevy of other differences that exist between blocs. Etihad and ISCI, for example, differ greatly in their position towards Iran, with Etihad being generally opposed to Iranian activity in Iraq, and ISCI being amenable towards it. They also differ in what they view to be the ideal outcome of the cabinet reshuffle. Hakim, for example, supports a partial cabinet reshuffle, while Sadr is a vocal advocate of a complete overhaul of the government and replacing sitting ministers with technocrats. 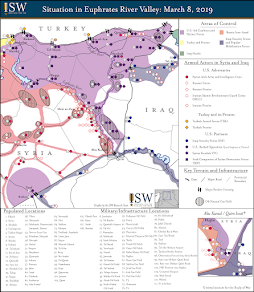 This sort of alliance could be viable in the short-term to disempower the SLA, but it is far from clear if it would be sustainable in the long-term, as the inability of Kurdish, Sunni, and Shi’a parties to come to agreements on important legislation has prevented major laws, such as the Federal Judiciary Act, the National Guard Law, and the Justice and Accountability Law from passing in the CoR. PM Abadi is in an extremely difficult situation. Many political blocs do not want him to overhaul the government, despite their public insistence that this is the case. Most of the major political blocs have not even submitted nominations for cabinet positions, indicating that they are still attempting to negotiate what the final composition of the cabinet will be amongst themselves. The only exception has been the Sadrist Trend’s 90-name list, which may not even be considered, because the list’s technocratic nature threatens to remove political party members from senior governmental positions. Yet many blocs, aside from pro-Maliki components of the SLA and affiliated parties, are opposed to Maliki and could form a united front against the Dawa Party-dominated SLA in order to promote their interests. This may be sufficient grounds for disparate parties to form a compromise over the final cabinet composition. There are several courses of action the cabinet reshuffle process may take, all of which can be problematic for U.S. interests. If PM Abadi attempts to initiate reforms along the lines of Sadr’s proposals, political blocs could obstruct their passing, as Sadr’s reforms would replace senior political bloc members with technocrats. If ISCI decides to form an agreement with the SLA and abandons talk of the cross-sectarian bloc and support for Sadr to protect its positions within the cabinet, then Sadr would react poorly, escalating his supporters’ street activity and potentially even leading to violence. Clashes between Sadrist supporters and the security forces would severely undermine the stability of the government and intensify the political crisis. Alternatively, security forces and even members of Iraqi Shi’a militias opposed to Sadr might attempt to break up the sit-in or keep demonstrators from reaching the Green Zone during the regular demonstration time on Friday, March 25, which might also lead to violence and instability. Alternatively, Sadr, ISCI, and other political blocs could successfully form a united anti-Dawa Party front through the new cross-sectarian bloc that sees Maliki’s power reduced. This would be contingent upon Sadr sacrificing some of his demands, as no other political party seriously wants their ministers removed from the cabinet. However, Sadr could be placated and could call off his sit-in if there is progress towards forming the new cross-sectarian bloc and loosening Maliki’s dominance over the government. Yet it is not clear if PM Abadi would be able to survive as the premier in this scenario, as PM Abadi, a Dawa Party member, may not be able to unshackle himself from the SLA. Both Sadr and members of ISCI have mused on the possibility of life after PM Abadi, however, and they may be comfortable attempting to identify a consensus candidate from within their own ranks if they cannot pry PM Abadi out of Maliki’s grip. It is also not clear if the new bloc can even function, as it must overcome myriad differences to achieve anything. How Sadr responds to the ongoing cabinet reshuffle, however, remains the major question regarding how the cabinet reshuffle process will play out. Sadr’s position differs from the other political blocs in that his motivations are not purely based on increasing his political power within the government through the accumulation of ministerial or senior government positions. He has been pursuing other paths to influence, including attempting to take the role of the leader of popular street demonstrations, a role that Grand Ayatollah Ali al-Sistani played prior to February 2016, when he ceased giving political sermons. He also appears to be attempting to reassert control over his own movement, including al-Ahrar Bloc; his public distancing from the bloc, the referral of the bloc’s two ministers to the Integrity Commission for corruption investigation, and the “detention” of former Deputy Prime Minister Bahaa al-Araji may indicate that he is distancing himself from the bloc’s behavior while attempting to reestablish control over its members. In addition, Sadr’s nominations for cabinet positions is more technocratic than representative of the Sadrist Trend, indicating that he may be willing to cede power within the cabinet in exchange for maintaining his role as a leader of the anti-corruption movement and bolstering his personal role in Iraqi politics. Sadr thus has several options. If the government undergoes a partial cabinet reshuffle, then he could incite his supporters to engage in further street demonstrations and possible political violence. Sadr may also resort to less extreme options. He might, for example, withdraw the al-Ahrar Bloc from the government and opt to continue the sit-in while preserving his position as the leader of popular demonstrations against corruption. Considering the historical lack of discipline of Sadr’s supporters, an extended sit-in and repeated demonstrations could also lead to instability and political violence; the fact that Sadr’s supporters reportedly almost attacked the Baghdad Governor is a poor indicator for the sit-in movement’s long-term discipline and adherence to non-violent behavior. Sadr might alternatively accept an increased number of Sadrists within the government – in effect, abandoning the idea of a comprehensive cabinet reshuffle for increased cabinet representation. This would however require Sadr to sacrifice much of his legitimacy as a leader of the anti-corruption performance, which is highly unlikely. Stuck amidst the realignment of interests within the Iraqi Shi’a political scene remains PM Abadi, who is tethered to Maliki through his membership to the Dawa Party but genuinely appears to want to undertake reform. Hakim and Sadr may be willing to keep PM Abadi in his position if they can accumulate enough collective power to form an anti-Dawa Party movement, but are likely equally willing to pursue deposing him if PM Abadi is unable to separate himself from Maliki. Similarly, the SLA may be willing to force PM Abadi to resign if he is unable to conduct reforms to their liking, and could attempt to pursue other Shi’a blocs of forming a new government with a new prime minister, such as current National Alliance chairman Ibrahim al-Jaafari. PM Abadi thus appears to be stuck between the Shi’a political blocs, and may not survive as premier no matter which direction he decides to take the reforms.